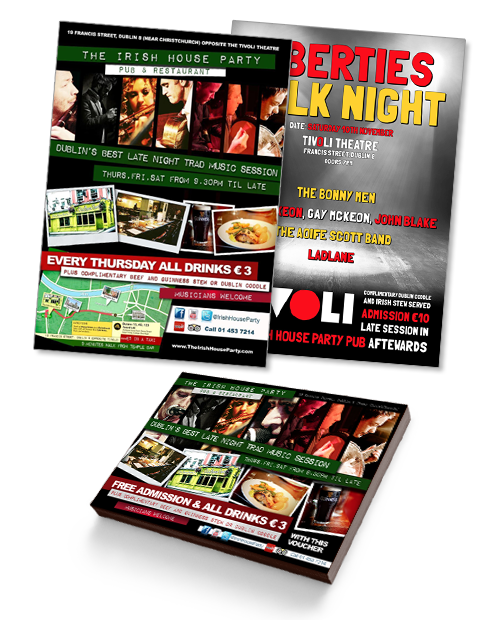 Project Brief: Online Design was approached by The Irish House Party to create and print a promotional flyer which they can send out to various tourism information centers to give an overview of their unique Irish music and Irish dancing show. Not only does the Irish House Party entertain their visitors but they also provide packages to include dinner at their dedicated venue. Project Outcome: The solution was to create a variety of printed material with vibrant imagery from their shows to display the excitement and uniqueness of their shows. The Irish House Party has expanded their services to include accommodation and they have since been awarded certificates of excellence and consistently voted as one of the top ten things to do in Dublin on TripAdvisor.